.... the food is FINE. This week heralds the beginning of the next phase in produce at the Market - the arrival of stone fruit (peaches, nectarines, cherries) from various parts of Illinois, as well as the arrival of a wider variety of vegetables. For a complete produce list, head over to the City's Weekly Market page - that's where you'll get the, uh, dirt on the weather forecast for Saturday morning, as well as produce and other food availability. 1. 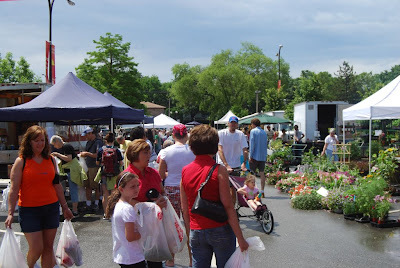 The Market goes on rain or shine every Saturday during the season! 2. Come prepared if the forecast looks dicey - bring an umbrella, a poncho or raincoat, and some boots or other waterproof shoes if squishy shoes weird you out. 3. Some vendors opt out of attending on rainy days. Stop by the City's tent to get up-to-date information about who's at the Market and who isn't on a rainy day. Also, tomorrow's Market will be going on while the folks from Fluid Motion Productions prepare for the first annual Blues, Brews, and BBQ festival, which is happening from 11:30 AM-10 PM in the parking lot directly south of Lincoln Square Village. Come out and help Urbana celebrate its 175th birthday, y'all - there'll be BBQ, beer and other beverages, and some very well-known blues talent - Lonnie Brooks headlines. Click here for more info about the Festival. See you tomorrow, weather or no weather. 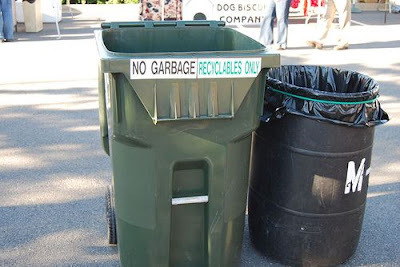 We encourage all patrons to put recyclables - paper, cardboard, and most plastics - into the recycling bins, and all trash into the trash barrels. Many thanks to Courtney Rushforth, the City's Recycling Coordinator, for getting us the toters and developing increased signage. If your question has to do with food, like, "What the heck is kohlrabi and what do I do with it? ", there are a couple of books regarding seasonal produce that you might want to have a look at. The Real Dirt on Vegetables: Farmer John's Cookbook is one of the best books out there for dealing with seasonal produce. Farmer John Peterson owns and operates Angelic Organics just outside Chicago. These folks run a huge CSA (Community Supported Agriculture) operation and routinely send out newsletters to their members offering tips about how to prepare the food that comes in members' boxes every week. Those newsletters morphed into this cookbook - lots of information about their farming methods included with the recipes. If you haven't seen the documentary The Real Dirt on Farmer John, which documents John Peterson's ups and downs on the farm, it's available on DVD locally. Recommended. The book Simply In Season is a recent discovery of mine - I grew up with the More-With-Less Cookbook, and this book is done in much the same vein (in fact, M-W-L inspired this book), only focusing on the kind of fresh, local foods one comes into, well, at their local farmers' market. The recipes are simple, healthful, organized by season, and way tasty. Available everywhere, including your local library. Produce at the Market this week: Strawberries are winding down (but still available), and we'll be catching our breath for a couple of weeks before the stone fruit (sorely missed last year after the April freeze (PDF) that killed most of Illinois' fruit crop) starts rolling in. This week some other fruits are available - look for some sour cherries, blueberries, raspberries, and maybe even a few gooseberries. Vegetables continue to come on - in addition to last week's bounty, this week's will include green beans, broccoli, and some "cukes and zukes". A few greenhouse tomatoes will be around, and there should be a vanload of hydroponic tomatoes. Don't forget your greens, kales, peas, radishes, turnips, and other late spring veggies. Don't forget to shop all five rows at the Market - we have produce/growers in every row this year, so if you can't find what you're looking for, check another row, or ask the Market staff at the City tent - we're happy to unite patrons with Illinois-grown or -made items. As always, you can email me with questions or comments, or comment here. The site maps are printed. The weather looks great. Alisa at Smile Politely wrote about us this week - thanks! In one of the season's most anticipated arrivals this year, the Meisters are bring their gluten-free mixes and baked goods to the Market tomorrow. While folks with gluten sensitivities will now be able to chow down some breakfast in-hand at the Market, keep in mind these treats are tasty whether you're wheat-free or not. Time to locate some sunblock - until tomorrow! Hull the strawberries. In a bowl, layer the strawberries and sugar. Let stand for several hours in fridge to allow the berries to "juice up". Cook 4 cups of berries and juice at a time in a heavy, deep pan. Bring to a boil quickly and reduce heat to medium-high, cooking for 15 minutes. After cooking, place in glass jars or plastic containers, and refrigerate. You can freeze preserves that won't be eaten within a week. I'm a huge fan of freezer preserving - it's a great way to get some springtime when the season is long gone. - The new recycling bins will be in full effect this Saturday - there'll be one by the City tent and a couple others throughout the Market. - Wondering where to park your bike at the Market? Click here for more information about biking in Urbana, and a map of the City's available bike parking. 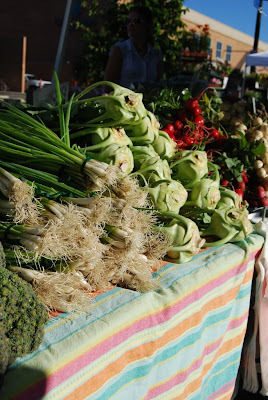 - Curious about what's available at the Market this week? Hoping to get a site map of the Market? Looking for more information about U-Cycle, the City of Urbana State Tree Trail, the Public Art Program, and other City initiatives? Stop by the City's tent at the northwest entrance to the Market (the entrance closest to Lincoln Square Village) to pick up literature, ask questions, or just to say hello. A final produce availability list and some news about June 14 Market vendors will be posted tomorrow - in the meantime, please take our very unscientific poll over there in the sidebar. And I'm not talking about the rain... I hope. The June 7 Market, while quite rainy and more than occasionally ominous-looking, still had its share of raindrop-dodgers (and not-dodgers) out on the prowl for fresh, local produce, like the above chard from Blue Moon Farm in Urbana. It's also a bumper strawberry crop in Central Illinois this year. On Saturday I bought several pints to share with Market staff, but they were timid and only finished off a solitary pint. (Can you believe?) Maybe they don't like strawberries as much as I do. 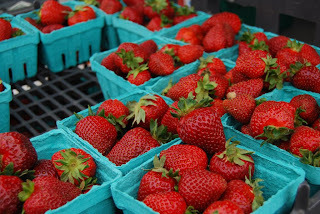 Regardless, the June 14 Market will be awash in strawberries, just ahead of the Urbana Park District's Strawberry Jam in Meadowbrook Park later that afternoon. You won't be able to resist - you can smell them as you walk the five rows. A quick note to a caller who mentioned the upside-down orientation of our site map in their message - I know it's weird, but the reason it's laid out that way is because the City tent is at the North end of the Market, which is where people usually look at the map and where staff direct people looking for something/someone specific. Which reminds me - more information about the City tent and what you can find there will feature in this week's Market preview entry, posted Thursday. Thanks to the fine folks at the City of Urbana's Public Works Department/U-Cycle, Market at the Square will have recycling bins for patron use at the Market this season. Look for them right next to the trash barrels. As you can see, they're not kidding around with the produce this week, and it's looking like the other food producers will be there in force as well. I think it'll be the first week where a cook can make an entire "real" meal from food purchased at the Market. Give it a try! More features, like links, will be added to the blog as time permits. Is there anything you'd like to see on the blog? Thanks to everyone who came out to the Market this past weekend. Estimated attendance was somewhere around 6000 people... many of them riding in on bikes. 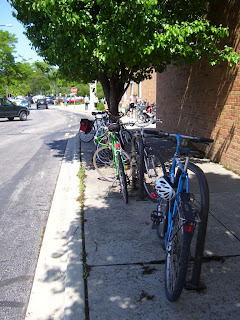 Here's a photo of the full bike racks near the Market around 10 AM during the May 31st Market - look just past the tree for more bikes! Actually, the photo doesn't really do justice to the wide variety of two-wheelers we spotted that day. We welcome bikes at the Market - just remember to hitch your ride to the bike racks provided around Lincoln Square before entering the Market. Sometimes I feel like our oft-fickle Illinois weather is really smiling on us so far this season, and last week's Market was no exception - at 7:05 AM, just after open, the last of the mildly threatening-looking clouds burned off and were replaced by incredible sunshine and some longed-for warmth. Patrons bought all manner of seasonally available produce - and this year, things are moving slowly due to the cool, wet, and cloudy spring we had - and hung around to check out the art, crafts, baked goods, performers, and prepared foods that have helped make Market at the Square one of the best markets in Illinois. I'm always looking for ideas and feedback - please drop me a line if you're so inclined. You can find more photos of Market at the Square at our Flickr page, and if you're on Facebook, you can follow the Market there, too. I'll be updating later this week to give a preview of what you can expect to find at the June 7 Market... and maybe I'll hint at a few surprises, too.